“That is a neat collar. What does that tag do?” This is one of the questions that I get when I am out. What is so special about my collar? It’s a Pethub collar and it has a QRscruff tag on it. 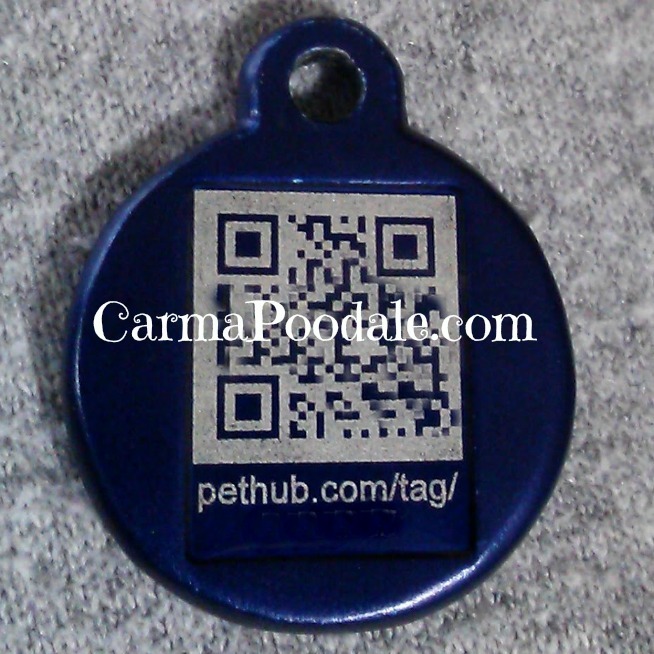 If you find a lost pet and it has a PetHub tag on the collar, all you have to do is scan the QR tag with your smart phone. It will pull up the pets’ info,medical or food special needs along with a phone number so you can call their owner to alert them you have their dog or cat. I have had a red Pethub collar for over a year and I have to say, it’s been my favorite collar. I wanted a change in color so ma purchased me a purple collar. They have many many colors to choose from but purple is my favorite color of all. 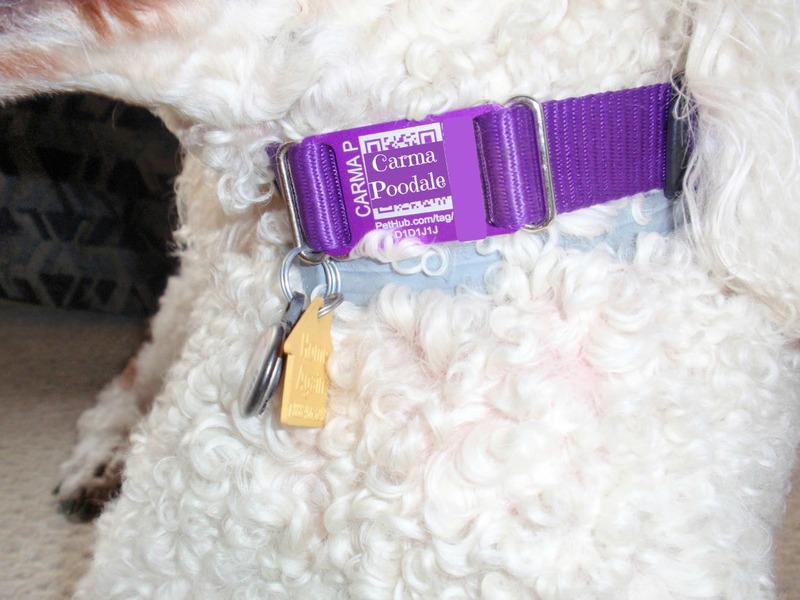 If your fur kid has a favorite collar or wants to change collars with each season like Jenny Sue, my sissy spaniel does, then they have a PetHub tag. The tag clips to the collar with a O ring like a microchip tag or rabies tag. They come in a variety of colors, size, shapes and I am sure you will find something you like. When you turn the tag over it has a QR code on the back. Scanning this will also take you to the pet profile page where you can see uploaded photos and info on how to contact the owner. If you don’t have a smart phone you can look up the number online at PetHub.com. There is a link on the top right that says ” I found a Pet“. Click the link, put the special code in and click “FETCH” There is the info to call. There are have different types of coverage you can purchase with the tags. The basic plan comes with a profile that pawents can set up with photos, info, things like special needs , etc. There is a 24/7 Found pet hotline number also This is free with the tag. They have a gold and silver plan also. With the purchase of the Silver plan ($39. a year) includes a alert when someone views the pet’s profile, you will get an email notification, and if they viewed it by scanning the QR code with a smartphone, any GPS data can be pulled from that smartphone then it is included in that email, so they know where to start looking for their pet. You can also send out a shelter alert and print posters. As soon as you know your pet is missing it , contact the customer call number or go to the website and click the link “Report a Lost Pet” then “Send out Shelter Alert”. it will contact all the area shelters with a Amber Alert in your area. With a Gold Plan ($49 a year) you get the same protection as you do with the silver plan but it has added benefits. It includes a $3,000 emergency insurance policy for if your pet gets injured while lost. So many dogs or cats get hit by cars when they are out on their own and this policy will help with those expenses. You can also purchase the policy for additional pets in the home for $5.00 but you must purchase the Gold Plan to do this. There are some exceptions to the plan but it’s well worth the coverage. These plans are only good in the United States right now. PetHub has allowed me to give away 3 FREE tags!! Be one of the first responses saying “I want to be a PetHub pup or kitty!” PetHub will send you a free QR tag with basic coverage!!! Yes they make tags for kitties too! How exciting is that?! I am super excited to know that 3 of my readers will be a PetHub kitty or Pup. I love my collar and I loved my tag before I had my collar and I know you will will be happy with yours too. If you aren’t one of the first but still want a tag don’t forget to use the Carma20 special code. Always microchip your pet as added protection. Most people will not think about taking your pet to a vet office, shelter , or humane society to see if it has a micro chip. With this tag, they can scan it , find out who the pet belongs to and get them back home quicker. Its 24/7 coverage. Most offices and shelters are not open on Sunday’s and the time the pawent and a pet is apart will be heartbreaking. I want to thank PetHub so very much for giving me a special code and 3 free tags to share with my readers. They have a pawsome customer service too. You can find Pethub on FaceBook and on Twitter. ← B/W Sunday Have you seen me? That's a great idea! I've never seen one before! Lucky girl! They are really cool. Ma test mine often to see if it shows up right and it always has. Have a tail wagging day! Pam, Instant message me your email on Facebook please.Thank you for reading my blog!! Good Luck in the contest!!! Thank you for reading my blog and entering their contest. Those look like some fabulous prizes!!! I want to be a pethub pup, the offfer probably won't apply to the UK though. Them QR tags are a great idea.Sheba. Ian–we are definitely in the UK! Our tags work world-wide and we ship internationally! Hi Ian, As you can see PetHub is definitely in the UK too! Send me your email and you will receive a FREE tag from Pethub!How cool is that? I think it is pawsome!! Thank you, email adddress forwarded to you. I love QR codes! They are so useful! This is a great way to use them to make sure your pets are found if lost. If 3 pups or kitties haven't already gotten to it, Luna says "I want to be a PetHub pup!" Another great review, Carma! I want to be a PetHub kitty! (Well, actually, my brofur Harvey does!) What a great product!